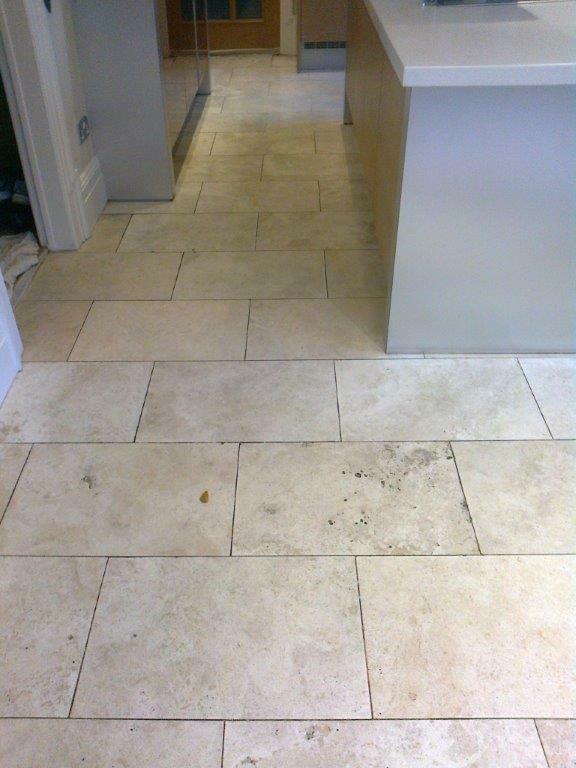 This Travertine tiled floor installed in the kitchen of a house in Holmes Chapel was proving impossible to clean and this was compounded by the fact that black dirt had become trapped in the natural holes in the Travertine. The floor was given a wash with Tile Doctor Neutral Cleaner to remove any surface grit and this was followed by the application of the Tile Doctor burnishing system which involves the use of a set of four Burnishing pads fitted to a rotary machine. There are four pads and you start off with a course stripper pad with a little just water and then carry on with the finer pads until the floor is thoroughly cleaned and any previous sealer removed. The next step was to use Tile Doctor Pro-Clean along the grout lines with a stiff brush to get the grout cleaner and also around the holes in the travertine where dirt had become ingrained. Once the small holes were clean they were then filled with a matching coloured grout. To bring up the polish on the Travertine tile the last of the four burnishing pads was applied with gives a final polish. To seal the floor and protect it from staining two coats of Tile Doctor Colour Grow was applied; Colour Grow is a colour enhancing sealer which enhanced the natural colours in the stone. Once dry the last step was to buff the floor to a nice shine with a rotary machine fitted with a white pad. 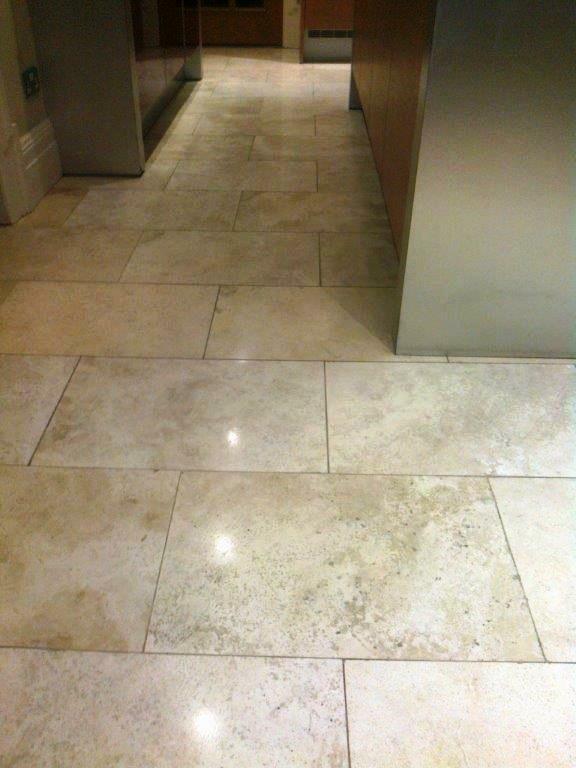 This entry was posted in Work History and tagged cleaning services, Holmes Chapel, kitchen, north cheshire, tile cleaning, tile restoration, tiled floor, trapped dirt, travertine cleaning, travertine tile by Steve Keary. Bookmark the permalink. Always best to esnure those natural holes in Travertine are filled.